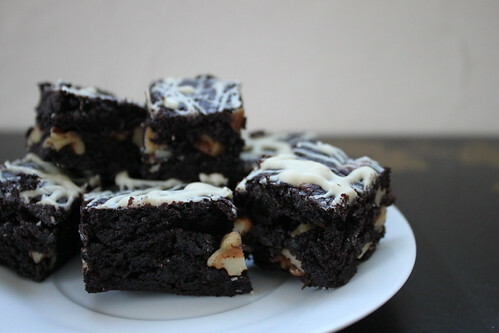 One hundred million, and sixty, arbitrary, Whose Line is it Anyway-style points for you, Browned Butter Brownies. While you celebrate your win, I’m off to eat one hundred sixty million more calories of brownies. Toodles. Position rack in bottom third of oven; preheat to 325°F. Line 8x8x2-inch glass baking pan with parchment paper. Whisk cocoa, sugar, and salt in a bowl and prepare 2 teaspoons water and vanilla. Melt butter in medium saucepan over medium heat. Cook, stirring often, until butter stops foaming and browned bits form at bottom of pan, about 7 minutes. Remove from heat, immediately add to cocoa mixture, and add water and vanilla. Stir to blend. Let cool 5 minutes (mixture will still be hot). Add eggs to hot mixture 1 at a time, beating vigorously to blend after each addition. When mixture looks thick and shiny, add flour and stir until blended. Beat vigorously 60 strokes. 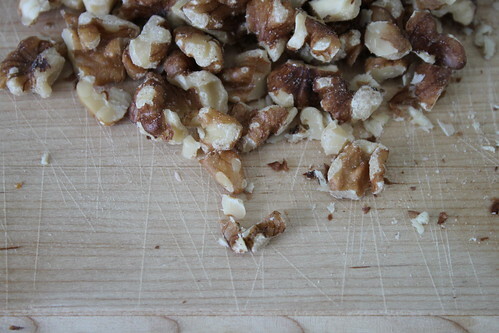 Stir in nuts. Transfer batter to prepared pan. Bake brownies until toothpick inserted into center comes out almost clean (with a few moist crumbs attached), about 35-40 minutes; start checking, however, at 25 minutes. Cool in pan on rack; once cool, cut into mini squares. 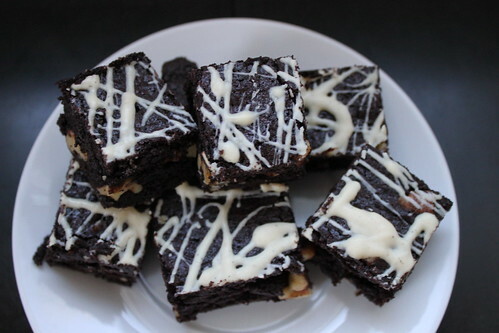 Drizzle with white chocolate, if desired. 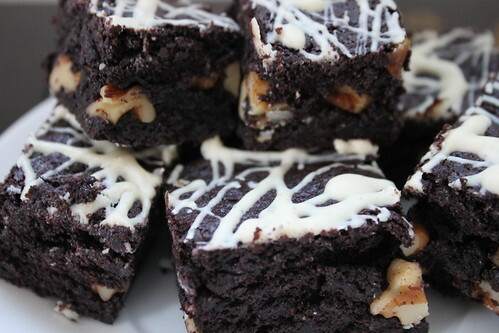 Brownies keep in airtight container for up to two days.